he proportion of doctors providing any charity care decreased from 76.3 percent in 1997 to 71.5 percent in 2001, according to a new study by the Center for Studying Health System Change (HSC). The proportion of physicians serving Medicaid patients also decreased from 87.1 percent in 1997 to 85.4 percent in 2001. The small decrease in physicians serving Medicaid patients does not appear to have had any negative effects on access to physicians among Medicaid beneficiaries. On the other hand, the more sizable decrease in physicians providing charity care is consistent with other evidence showing decreased access to physicians by uninsured persons. New budget pressures could lead states to freeze or cut Medicaid provider payment rates, which could then trigger access problems. Although the majority of physicians care for Medicaid and uninsured patients who are unable to pay, the percentage of physicians serving these patients has declined. 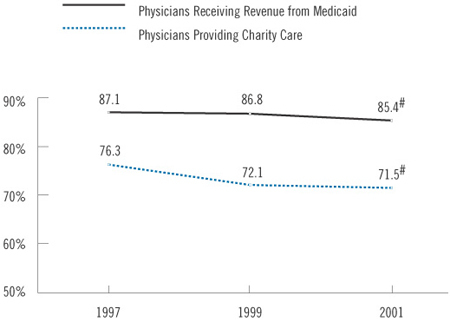 The proportion of physicians deriving income from Medicaid dropped slightly, from 87.1 percent in 1997 to 85.4 percent in 2001 (see Figure 1). The proportion of physicians providing charity care dropped more substantially, from 76.3 percent in 1997 to 71.5 percent in 2001. # Change from 1997 to 2001 is statistically significant at p<.05 level. ost physicians who serve Medicaid and charity care patients see relatively few of these patients. Among physicians with any revenue from Medicaid, more than half derived 10 percent or less of their total practice revenue from Medicaid, and only about one-fourth (25.6%) derived more than 20 percent of their revenue from Medicaid. Between 1997 and 2001, however, the percentage of low-volume Medicaid providers decreased (from 56.6% to 53.1%), while the percentage of high-volume providers increased (from 22.2% to 25.6%). This indicates a greater concentration of Medicaid patients in fewer practices, and suggests no overall decrease in access to physicians among Medicaid beneficiaries if the slightly fewer physician practices serving Medicaid are seeing a higher volume of patients. Among physicians providing any charity care, 70.2 percent spend less than 5 percent of their total practice time on charity care, while 29.8 percent spend 5 percent or more of their practice time on charity care. In contrast to Medicaid, however, the proportion of high-volume charity care providers decreased between 1997 and 2001 (from 33.5% to 29.8%), while the proportion of low-volume care providers increased (from 66.5% to 70.2%). Thus, not only is the proportion of physicians who provide any charity care decreasing, but those who provide such care are spending less time doing so. As a consequence, access to physicians by uninsured persons may be decreasing to a much greater extent than for Medicaid patients. hysicians also limit the number of new Medicaid and uninsured patients in their practice to a much greater extent than they do other patients. In 2001, approximately one-fifth of physicians were not accepting any new Medicaid patients, and 16 percent were not accepting any new uninsured patients (see Table 1). This compares with less than 5 percent of doctors who were not accepting any new Medicare or privately insured patients. About half of physicians accepted all new Medicaid patients in 2001; less than half (44%) accepted all new uninsured patients, compared with 71.1 percent who accepted all new Medicare patients and 68.2 percent who accepted all new privately insured patients. NA=Not Available. Physicians were not asked about their acceptance of new uninsured patients. * Change from previous period is statistically significant at p<.05 level. hysicians who are heavily involved with managed care are increasingly closing their practices to new Medicaid patients. Among physicians who received more than 75 percent of their practice revenue from managed care, the proportion with practices closed to Medicaid increased to 27.3 percent in 2001, from 20.7 percent in 1997 (see Table 2). Among physicians in group- or staff-model HMOs, the portion not accepting new Medicaid patients increased to 21.7 percent in 2001, from 15.1 percent in 1997. In contrast, physicians who derived less income from managed care did not change the rate at which they accepted new Medicaid patients. Physicians with heavy managed care involvement also were increasingly closing their practices to Medicare patients. Among physicians who receive 76 percent or more of their revenue from managed care, the proportion not accepting Medicare patients increased from 12.7 percent in 1997 to 15.7% in 2001. In contrast, the percentage of these doctors who were accepting no new privately insured patients did not change (about 4%). This pattern of closing practices to Medicaid and Medicare patients while accepting privately insured patients may be related to the exit of many commercial health plans from Medicaid and Medicare managed care due to low payment rates and other market factors.4 The exit of these plans may mean that at least some provider networks affiliated with them no longer serve Medicaid or Medicare patients. 1 By level of managed care involvement. Other communities do not follow this pattern. For example, Phoenix has a relatively high proportion of practices closed to Medicaid despite having some of the highest Medicaid fees. A booming population in the Phoenix area may be fueling an increase in demand for physician services and leading to severe capacity constraints among medical providers. Physicians may be responding to this in part by limiting Medicaid patients in favor of more profitable privately insured patients. Other differences across communities, such as the prevalence of Medicaid managed care (which uses a different payment scheme), administrative rules and other market factors, also may contribute to differences across communities in physicians willingness to take on new Medicaid patients. he decline in physician participation in Medicaid is small at this point, and there is little evidence of a decrease in access to physicians among Medicaid beneficiaries. While there was a slight decrease in the proportion of Medicaid enrollees with a usual source of care (from 92.9% in 1997 to 90.6% in 2001), this mirrored an overall decrease in the United States. Actual use of physician services by individuals enrolled in Medicaid did not change during this period either. The larger decreases in physician charity care are consistent with evidence of a decline in access to physicians among uninsured persons. The percentage of uninsured persons with a usual source of care—which is already far lower than for any insured group—dropped to 64.2 percent in 2001, down from 68.6 percent in 1997, and the proportion of uninsured persons seeing a physician dropped to 46.6 percent in 2001, from 51.5 percent in 1997. Among those with any visits, the average number of visits did not change. ontinued financial pressures on physicians may decrease their willingness to serve Medicaid patients even further, potentially endangering access to care. States are experiencing serious budget pressures, and most are considering reducing or freezing Medicaid physician reimbursement to cut program costs.9 Rising health care costs as well as reductions in other provider payments may constrain physicians ability further to cross-subsidize free care to uninsured patients. And access to physicians is just one concern, as more general cost-containment measures being considered or implemented by states also could affect access to hospitals and prescription drugs among both Medicaid and uninsured patients. Continued monitoring of physicians involvement with Medicaid and charity care will be essential to assessing access to care for the uninsured and those enrolled in Medicaid. his Tracking Report presents findings from the HSC Community Tracking Study Physician and Household Surveys conducted in 1996-97, 1998-99 and 2000-01. They are both nationally representative telephone surveys. Each of the surveys was conducted over a 12-month period that overlapped two calendar years (i.e., from September 2000 to September 2001). For discussion and presentation, we refer to single calendar years of the survey (1997, 1999 and 2001). The Physician Survey is of nonfederal, patient care physicians who spend at least 20 hours a week in direct patient care. Each round of the survey contains information on about 12,500 physicians, and the response rates ranged from 59 percent to 65 percent. The Household Survey is of the civilian, noninstitutionalized population. Data were supplemented by in-person interviews of households without telephones to ensure proper representation. Each round of the survey contains information on about 60,000 people, and the response rates ranged from 59 percent to 65 percent. More detailed information on survey methodology can be found at www.hschange.org. 1. Bruen, Brian K., and John Holahan, "Acceleration of Medicaid Spending Reflects Mounting Pressures," Issue Paper, Kaiser Commission on Medicaid and the Uninsured (2002); U.S. Census Bureau, Health Insurance Coverage: 2001. 2. Although the increase in the percentage of physicians accepting no new Medicaid patients between 1997 and 2001 was not statistically significant at the p<.05 level, the increase was statistically significant at the p<.10 level. 3. Trude, Sally, and Paul B. Ginsburg, Growing Physician Access Problems Complicate Medicare Payment Debate, Issue Brief No. 55, Center for Studying Health System Change, Washington, D.C. (September 2002). 4. Felt-Lisk, Sue, Rebecca Dodge and Megan McHugh, Trends in Health Plans Serving Medicaid-2000 Update, Kaiser Commission on Medicaid and the Uninsured (2001); Gold, Marsha, and John McCoy, Medicare+Choice Withdrawals: Experiences in Major Metropolitan Areas, Monitoring Medicare+Choice, Operational Insights No. 8, Mathematica Policy Research, Inc., Washington, D.C. (September 2002). 5. Perloff, Janet D., Phillip Kletke and James W. Fossett, "Which Physicians Limit Their Medicaid Participation, and Why," Health Services Research, Vol. 30, No. 1 (1995); Coburn, Andrew F., Stephen H. Long and M. Susan Marquis, "Effects of Changing Medicaid Fees on Physician Participation and Enrollee Access," Inquiry, Vol. 36 (1999). 6. Variations in Medicaid fee levels across the 12 Community Tracking Study communities are based on state Medicaid fees as reported in Menges, Joel, et al., Comparing Physician and Dentist Fees Among Medicaid Programs, Medi-Cal Policy Institute (2001). 7. Menges et al., op. cit. 8. Mays, Glen P., et al., Market Instability Puts Future of HMOs in Question: Seattle, Washington, Community Report No. 3, Center for Studying Health System Change, Washington, D.C. (Winter 2001). 9. Smith, Vernon, et al., Medicaid Spending Growth: Results from a 2002 Survey, Kaiser Commission on Medicaid and the Uninsured (2002). TRACKING REPORTS are published by the Center for Studying Health System Change.